Can blockchain technology and smart contracts help prevent medical costs from spiraling out of control? Individuals are dialed into paying high costs for all sorts of vital and aesthetic services and fees. This includes a litany of banking, insurance, and medical fees that have largely snowballed out of control in years past. However, the advent of smart contracts is poised to disrupt the medical industry with Robomed network pioneering a decentralized medical network. Nowhere is the trend of rising medical fees more prevalent than in the United States and Europe. In light of rising costs, the Robomed network has turned to the blockchain to provide the most comprehensive and streamlined medical care to date. What is the Robomed Network? The Robomed Network is a medical ecosystem managed by a blockchain token and designed to provide the most effective medical care. In particular, the ecosystem bridges healthcare service providers and patients on the basis of a smart contract. These mechanisms represent a new form of technology made possible by public blockchains. 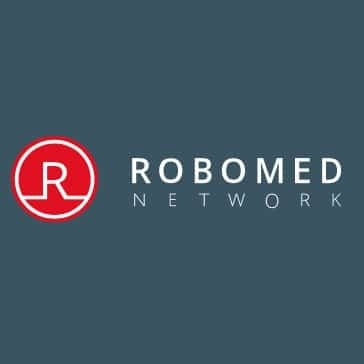 For its part, the Robomed Network is aiming to disrupt the traditional medical service-oriented system, aiming to displace it with a more patient-centric format. This innovation is new to the healthcare space, previously gaining traction in other sectors. The global healthcare industry is a $7 trillion market, aggregating public spending, out of pocket fees, and private insurance – Robomed Network’s targeted market is over $800 billion. The Robomed Network has identified this area as a catalyst for change in the broader medical space, which will herald the launch of a token crowdfunding sale. Robomed Network will be issuing its own tokens, backed by Ethereum, to support smart contracts between healthcare providers and patients. Subsequently, RBM smart medical contract will look to improve service value by granting its respective owner full accomplishment of clinical guidelines for a specific case by healthcare provider. This is of particular relevance given Robomed clinical guidelines are continually subject to constant improvement by the external professional medical community. In doing so, experts will be motivated for higher goals and bonuses offered by Robomed Network. To help accomplish this, Robomed will be launching an initial coin offering (ICO) starting on October 25, 2017 and lasting for a period of fifty days until December 15, 2017. 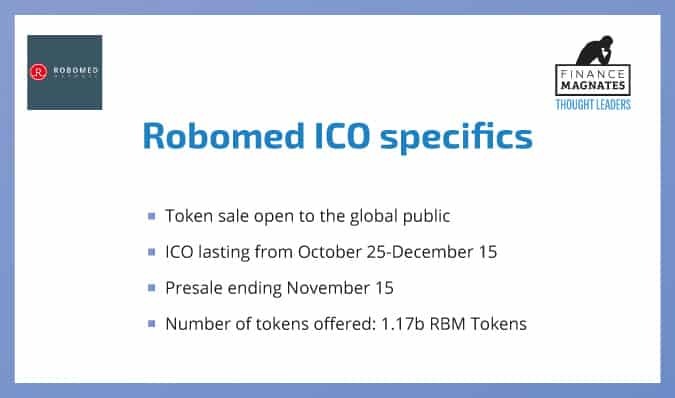 The ICO will be open to the general public globally, which will include the sale of RBM tokens as well as a Presale that will end on November 15, 2017. Individuals are invited to consult the project’s whitepaper. The RBM Token is an Ethereum Token, which empowers its users with the right to vote when determining the value of medical services within the Robomed Network. Consequently, this can be accepted as payment for medical services as rendered by medical providers participating in the Robomed Network. All clinics affiliated with Robomed Network accept tokens as payment backed by Robomed Network guarantee to buy them out at a fixed price. Patients themselves do not have to purchase RBM tokens, instead they can pay in a local currency converted to the price of RBM token in Ether. The overall project was founded by Philipp Mironovich and Ivan Devyatkov. Both individuals have opted to launch the initiative after lengthy careers respectively in the healthcare sector. Bolstered by a star-studded cast including Thomas W. Feeley, Anthony Provasoli, David Drake, and other advisors, the Robomed Network represents the collective understanding of decades of experience across the healthcare space.